Hello! I didn't mean to take a month off from blogging! Getting back to the sewing room with a newborn has been challenging; blogging about it, more so. We are finally starting to pull out of survival mode and jump into life again. As far as sewing, these do. Good Stitches blocks for my Haven circle seemed like a great starting point. I love these Rolling Diamond blocks from Sara's tutorial. They should make a really striking quilt. And couldn't resist sharing a picture of the little guy, Sean. I can't believe he is already a month old! He is spoiled rotten. Most naptimes are spent in my arms, not because he is fussy, just because I can't resist. I know he is most likely my last baby and I am making sure to savor everything! I will be back again soon with a Circle 7 update. I changed my whole theme and here is a sneak peak. This block was made using the badskirt Free Bee pattern from this post. You are something else..back making blocks when Sean is only one month old. Are you going on Thurs nte to MQG? Anyway I also saw that bee download and put it in my Evernote for future contemplation. Yours is wonderful. I am glad that you are humming along! Sweet baby pic. Thanks for the update. Remember when baby sleeps, mama sleeps. Enjoy. He's gorgeous! I love gratuitous baby pics. Sean's a big boy! Sean is adorable! You are right to savor every moment. Spoil him all you can! 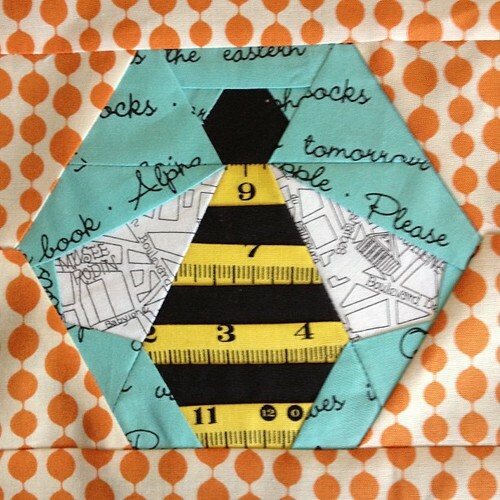 Love your blocks - especially the bee one! 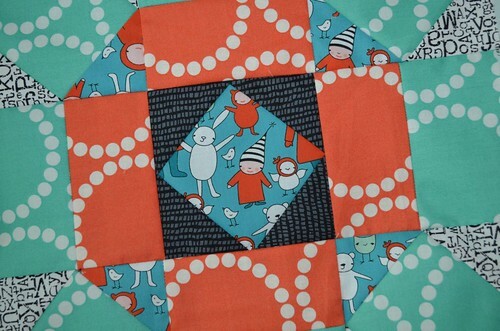 Darling blocks and darling baby Sean on a fabulous quilt! Congratulations! I can't believe he is a month old already! He is such a cutie. Enjoy your mommy time it is over so quickly. Great job on your blocks I love the fabrics you are using. For what it's worth, I took a nearly three year hiatus from sewing when the twins were born! Enjoy savoring those naps-nothing sweeter than a sleeping baby! What a cutie. You SHOULD enjoy every single second of his young life. They grow SO fast. It's a frustrating time quite often when they are little, but so worth it to know what you do now will mold their young lives forever and make them wonderful adults. One of my twins had to move back home last year temporarily along with his fiancee and his daughter, who at the time was about 4 months old. It was A HUGE change to our quiet home to have 2 adults move in and bring with them a baby and also their two dogs and the puppy the dogs had had previously. And then those rotten dogs felt the need to act like animals (haha) and we had four more puppies. ACK. FOUR! That was a huge shock since the Momma is only about 5 lbs and that breed is NOT supposed to have that many. Yea, well surprise! Anyway, as I said, our very quiet home was turned upside down, BUT, I would not have traded the time we have been so fortunate to have in spending with our Granddaughter to watch her grow from a tiny baby into a walking and chattering little girl now that she's just turned 1 in Feb. I have LOVED every single second of my time with her. Sorry, I got a bit sidetracked and this is not about me so yes, take your time now because they do grow so quickly and you sure can't get this time back again. Pop in and say hi once in awhile but I would hope no one would be angry or leave you for taking this time you have now to enjoy that adorable little guy.